975 Cushion Trax Ultra Floor Mat in use. The 975 Cushion Trax Ultra Floor Mat is engineered from a durable diamond plate top made from 100% recycled PVC bonded to a dense closed cell foam base using NoTrax exclusive UniFusion technology which eliminates the possibility of separating the two materials. By using this anti-fatigue floor padding you are giving your workers added comfort and support they need to be more productive because proper blood circulation allows for standing longer periods of time preventing lower back pain and muscle fatigue. Slope beveled foam on all four sides allows you to safely walk over the mat without the dangers of tripping. Cleaning Cushion Trax floor mats is simply done with a broom. 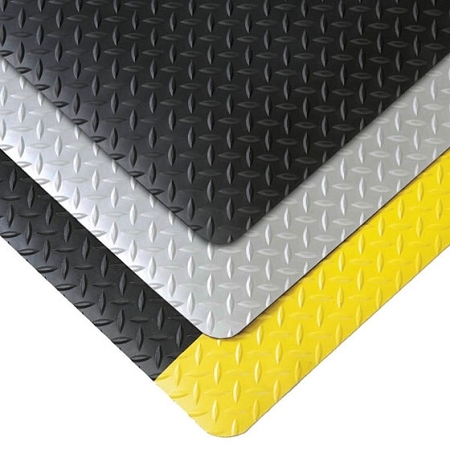 Outstanding comfort and ergonomic design makes Cushion Trax Ultra floor mat by NoTrax the ideal floor padding for multi-shift operations in dry work areas like assembly lines, packing areas and machine workstations. 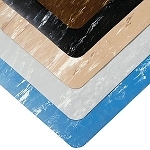 RedStop technology prevents mat from slipping and sliding on smooth floor surfaces.